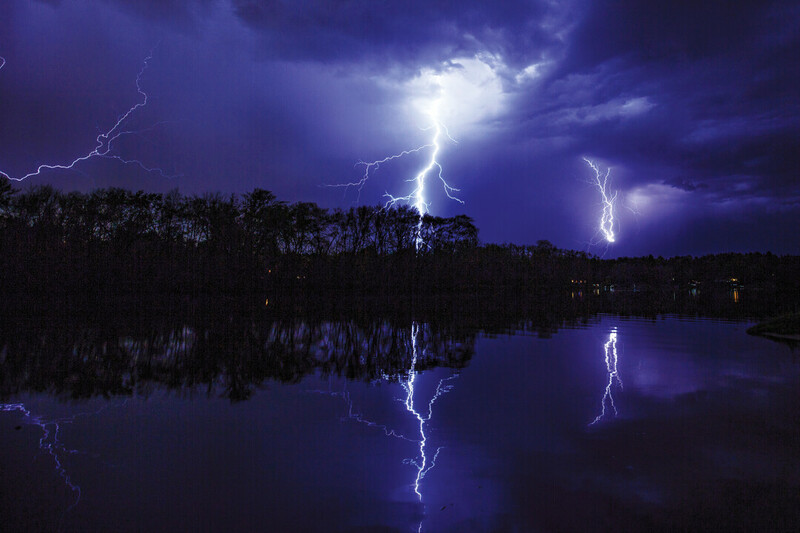 ‘I think it would be a good idea if you got out of the water,” Dad implored as lightning brightened the dark sky above me. “Just a few more minutes,” I responded, as if this conversation had occurred 30 years earlier andhe was instructing me to come in for dinner. “The sky is incredible right now, and it’s not even raining yet!” Of course it wasn’t the rain he was concerned about. While most take shelter when the siren warns of pending stormy weather, I take my camera and head outside in search of the perfect picture. I’ve photographed some incredible cloud formations and lots of lightning around the Chippewa Valley. The lightning took a while to figure out, photographically. You have to time the shutter just right and get a little lucky with camera placement and exposure settings. Every bolt is different, in location and intensity. Perhaps that is part of the draw for me: the technical challenges give way to elation when I capture that once-in-a-lifetime shot. Recently I was chasing a storm that took me from Elk Mound to the Veteran’s Memorial just outside of Neillsville. I took more than 500 photos that night. Two different times the hair on my neck stood up moments before a particularly close lightning strike. Last summer I was hanging out in the river with my 7-year-old son when a severe thunderstorm alert popped up on my smartphone. Pulling up the radar app, I noticed a large blob of red and purple moving across the screen toward our little blue dot. I told my son that we needed to get out of the water and asked if he wanted to come with me to see the storm. “Should be a good one!” I told my son as I jumped out of the truck. “I think I’ll just stay here,” he muttered nervously, strapped into his safety seat in the back. I attached my camera to a tripod and pointed its lens toward an ominous line of black clouds. Just then, a wind gust nearly pushed the camera – and the person holding it – to the ground. Sensing the fear in his voice, though, I reluctantly packed up my gear and climbed back into the truck. As the door slammed shut, the skies opened up and it poured. The wind was whipping and I could barely see the roadway directly in front of me with all the rain. There were many trees down in the area, including one large pine blocking most of the road back to our house. When we got home, I noticed several more trees and large branches were down in the yard, and our power was out. After several minutes, the rain finally let up and I thought it would be good to go back and move the tree blocking the road. My son and I got back in the truck, but as we came around a curve a few hundred meters from our house, a fire truck blocked the road in front of us. Apparently another fallen tree had taken down the power line and it was crossing the road – the road we had just come in on. So we had either driven over a downed power line or had just missed it. The thought of driving over a live power line, especially with my son in the vehicle with me, caused me to recalculate the potential costs and benefits of a good photograph. I was never worried about getting a little wet, and to me the odds of getting struck by lightning were so remote (about one in a million) that I really didn’t take that likelihood seriously. But fatherhood introduces additional variables into the risk/reward equation. After much pestering by my dad, I did eventually come out of the water that spring evening. I got some amazing images and managed to beat the odds and escape electrocution once again. I was also reminded that while Mother Nature may rule when it comes to weather, fathers and sons need to have each other’s backs when it gets stormy. Or in my case, both my father and my son.